Description Fight robo-animals, samurai, aliens and DINOSAURS! You heard right! Take the role of Max, a teenager with a jetpack, in order to save the world. 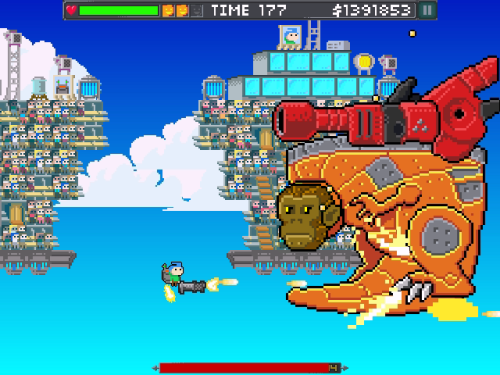 Join him to beat aliens, win cash, buy upgrades and cool hats while fighting to beat Boss 101. HARD MODE ADDED - PLAY 30 LEVELS AND WIN - that's right - hard mode starts you near the end against the toughest bosses! DO IT! "Way Too Easy" hat added - Want a challenge? Wear this!